NPO Saturn has become the owner of controlling interest in New Tooling Solutions CJSC (NTS) having acquired 25,01% of shares from Gazprombank OJSC in addition to its own 25,01% of shares. The contribution of ROSNANO OJSC remains unchanged amounting to 49,98% of shares. April, 26th 2012, Rybinsk. The Yaroslavl regional office of the All-Russian non-profit organization ‘Union of machine builders of Russia’ has made it to the top ten list of the Union’s regional offices in Russia based on the results of the regional office operating performance rating. Back in 2010 the Yaroslavl office was rated 52nd in Russia whereas following the results of 2011 it moved to the eighth position in the rating. In 2012 the office has reinforced its standing climbing to the third place of the top ten list as early as in March 2012. ‘On behalf of the Ministry of industry and trade of the Russian Federation allow me to congratulate you on the award of the EASA POA certificate authorizing your company to serially produce the SaM146 engine jointly developed by Russia and France! NPO Saturn submitted a program of development of a territorial innovation cluster to be located in Yaroslavl region named ‘Gas turbines and industrial turbines engineering’ to the Ministry of economic development of Russia. April, 24th 2012, Rybinsk – Yaroslavl region has come up with a program of developing a territorial innovation cluster under the name ‘Gas turbines and industrial turbines engineering’ aimed at the development of research and production potential of the companies – members of the cluster and creating in the city of Rybinsk an environment facilitating the development of a high-tech, innovation-driven small and medium-size entrepreneurship. 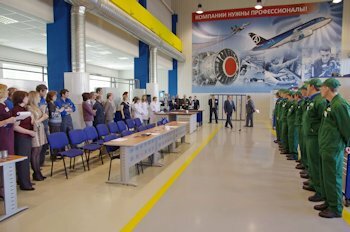 April, 23rd 2012, Rybinsk – NPO Saturn OJSC tallied up its operating results in the first quarter of 2012. The company’s chief executive officer Ilya Fedorov emphasized that ‘in a given period NPO Saturn has been able to ensure stable economic and quality performance which characterizes stability of the company’s operating system’. The product sales volume has amounted to 112,0%, the volume of production being 118,8%. In the period of 10 - 13 April 2012 NPO Saturn OJSC played host to a working visit of Bruno Millier, a representative of the Snecma Lean directorate, having the title of a Lean Master Black Belt and currently working as the head coach of the new Black Belts in the Industrial Division of Snecma. In order to eye-witness the main issues related to the production process and render the necessary counsel on solving them based on many years of experience of implementing disruptive Lean-projects in the companies within the Safran Group, Mr. Millier visited the main production facilities of NPO Saturn, i.e. workshops 12, 34, 49 and 35 and also VolgAero CJSC. A meeting with Victor Polyakov, NPO Saturn director of production took place. Bruno Millier gave a custom-made training to the NPO Saturn audience including the managers of workshops 12, 35 and 49 on the subject of ‘Performance management’ allowing to better understand and structure the constraints emerging on a daily basis in the production processes in order to solve them in the most effective and quick manner directly on the shop floor. A working meeting took place between the governor of Yaroslavl region Sergey Vakhrukov and the chief executive officer of NPO Saturn Ilya Fedorov. On April, 16th 2012 at the City Hall of Yaroslavl region a working meeting between Sergey Vakhrukov, governor of Yaroslavl region and Ilya Fedorov, NPO chief executive officer took place. April, 12th 2012, Rybinsk – Today on the International Day of Aviation and Space Engineering, NPO Saturn OJSC has received the POA certificate from the European Aviation Safety Agency for serial production of the SaM146 engines. April, 12th 2012, Rybinsk – The Engineering center Gas-turbine technologies OJSC (a joint venture between NPO Saturn and INTER RAO UES) has won the tender administered by ROSNANO OJSC for creating an engineering center that will specialize in innovation products, in particular the development of the GTD-110М – an upgraded version of the GTD-110 engine with the capacity of up to 110 megawatts. April, 10th 2012, Rybinsk – Celebrating the first anniversary since the moment of founding an NPO Saturn subsidiary – SatIZ CJSC – the first production site in the frame of the NPO Saturn ‘Tooling plant’ business project, Alexander Treshkin – the first general manager to lead SatIZ during its formation stage has been awarded the title ‘Project manager of 2011’.